The simplest definition of an extended wave is an impulse wave where the smaller degree internal waves demonstrates obviously visible wave amplitudes along with the wave degree in observation. In so doing, that internal wave structure dramatically extends the higher degree wave beyond what would be its normal expected length. They are elongated, sometimes dramatically, by the extension of the internal waves. Extended waves may also extend. See wave 1-2/1-2 structures for more information. Extension occur in impulse waves only. Therefore, corrective waves A and C may extend. Almost all impulse waves have one extended internal wave (1, 3, or 5). Rarely two waves (3 and 5) will extend. Never will all three waves extend. 80% of the time, it is wave 3 that will extend. Wave 5 is the next most frequent, then wave 1. Wave 1, having no predicted length, requires you analyze the internal structure before declaring it to be extended. 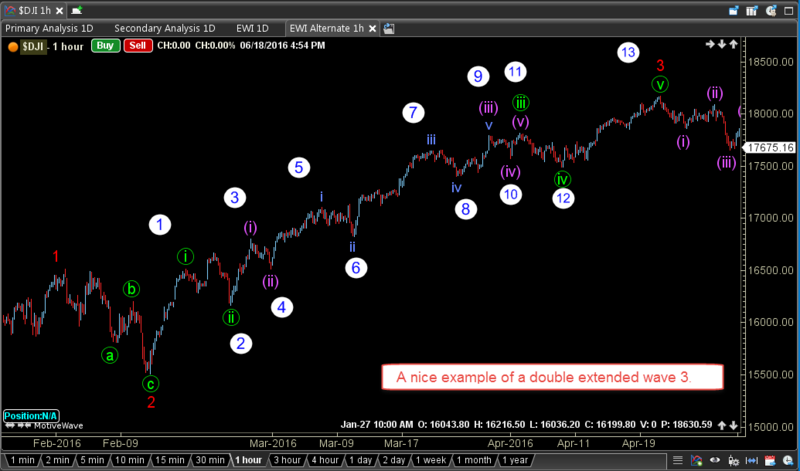 If internal wave 1.3 is greater than 1.618 times wave 1.1, it is technically extended. It is typical for waves 3 and 5 both to extend when they are of Cycle or Supercycle degree. Often the extended wave is the same wave as its parent wave. In a larger degree wave 5, for example, it is more common that sub-wave 5 extend. 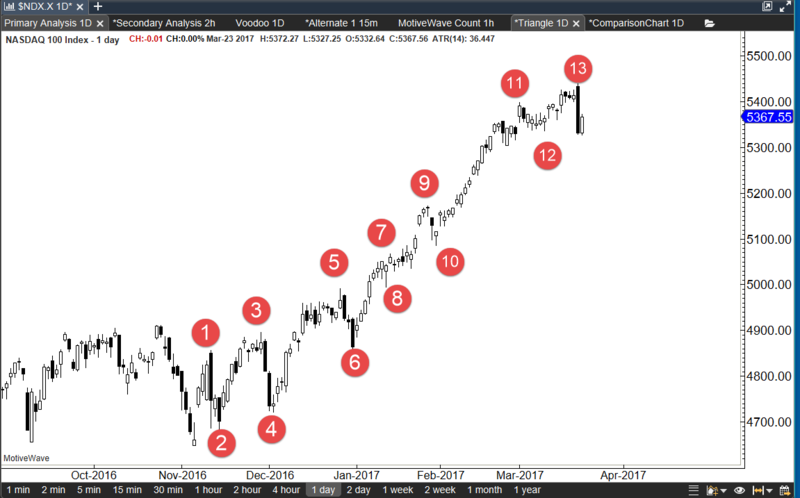 With extensions, the number of sub waves for the entire impulsive wave can resolve to 9 or 13 (double extension) most normally. Extensions may occur within extensions (Double Extension). Acceleration gaps frequently occur in a Wave 3 extension and a second gap. At times, an exhaustion gap offers some prediction you are nearing the end of a wave. Knowing this, scanning for gaps can help you hone in on stocks that are in the middle of an extension. Because the extension of a wave typically represents exuberance in the market, they tend to create a very steep price run. And frequently exhibit a series of "humps" on the chart for the multiple 1-2's and 3-4's that occur in the internal structure. Once you have determined that an extension is occurring, there is only one way to trade it, which is the direction of the wave. Enter the trade and ride it out. You won't be sorry. The following applies to all extensions, but is based on observations of a third wave of a third wave. It is practically impossible to trade the corrections of an extension. They don't last long, they frquently don't retrace near what you are expecting (it is very hard to identify the wave degree in the extensions) and, at times, the seem to be shortened versions of the typical A, B, C waves. What you think is wave A is often times the entire retracement, leaving you looking like an idiot when the trend resumes and you are still waiting for another swing. When the extended wave is over, you will know it and will still show more profit than if you tried to trade the corrections. Just don't do it! Perhaps it is not apparent, but there are a couple of key areas where you should pay attention to the wave structure. 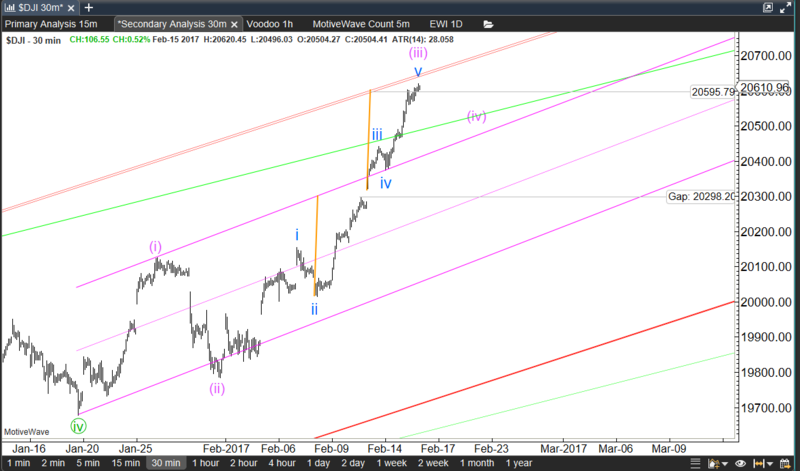 When a short correction after 5 takes back off and clears the wave 5 you know the wave count will now go to 9. You can stay in the trade until then. By the same analysis, when a short correction after 9 takes back off and clears the wave 9 pivot you now know you are going to 13. If you have been able to mark the 1-2,1-2 sequence(s) at the beginning of the chart, this gives confirmation to that labeling. Additionally if you happen to note an acceleration gap, use the measuring gap rules to at least approximate the end of the wave.